Kathy Murray has been immersed in the blues scene for a while now, and was an integral part of the Austin, Texas blues and R&B scene in the 1980s and early 90s, sharing the stage with the likes of Stevie Ray Vaughan, the Fabulous Thunderbirds and W.C. Clark. 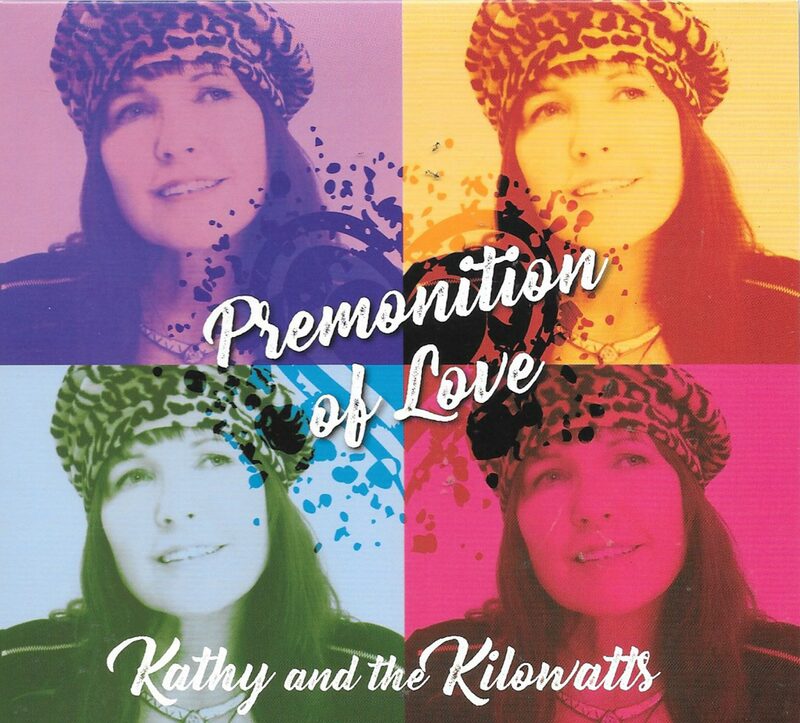 She and her band have released their fourth album, Premonition of Love under the esteemed name of Kathy and the Kilowatts. Listening to this album, she also absorbed the essences of country blues as well as zydeco, soul, rockabilly, rock and funk. That is quite a recipe and it is realised here with the help of her musical partner (and husband), William “Monster” Jones. First of a generous thirteen tracks is First Do No Harm: a bluesy R’n’B number with horns punctuating the adroit guitar playing of Jones, while Kathy shows her vocal abilities as she pleads for peace and love…not violence and even name checks Hippocrates! The title track, Premonition of Love, brings to mind the great Freddie King as Texas blues and funk join together for an original take on the style. Jones’ guitar is again perfectly suited to the song and the solo (along with a great bass line) is really well constructed. Kathy’s vocals are relatively laid back and almost spoken at times, but it fits in with the sentiments. Beggars Can’t Be Choosers is an instantly recognisable blues format; with some dirty horns doing what horns do best! The vocals are so expressive on this one and they are…sultry, as she is “starving for your love”. More horns, more funk as the pace increases for Always Fooling Me. The guitar is the ingredient that makes this one a stand out, and this song could have easily been on the Green Bullfrog album. Grow Some is a great title and the lyrics are a delight (although what need to be grown is never truly defined!) It’s all woven over a sort of jump blues pattern with great interplay between guitar and piano. The first of three covers is next with a fascinating take on Lowell Fulson’s Black Nights (written by Fats Washington). Kathy manages to inject even more texture, as she seems to call on her inner Ruth Brown to keep you involved. Jones does it again on guitar…empathetic to the original but with deft tones and style that makes it all new. Magic Sam’s What Have I Done Wrong follows and due respect is paid to the original but is given a total update with the combination of Kathy’s superb vocal interpretation and Jones’ guitar solo. Staying with true blues, Final Verdict is a harp-driven classic take, with a great bass/drum backing solidifying this almost Hendrix like slow, heavy blues. Eddie Shuler’s Sugar Bee is the third and final cover. It has a Cajun feel to the Kilowatts interpretation courtesy of Jones’ accordion work. Although the song doesn’t have the most varied or involved lyrics, Kathy’s heart doesn’t seem to be in it and it loses its bite because of that. Everything is back up to standard with Answer Yes; a Bo Diddley-style chunk of R’n’B, with a bit of a Stones, feel in the rhythm guitar. By the way Kathy…my answer is yes! More brilliant blues follow, this time in barrelling piano, roadhouse style, with All These Questions. The piano solo is hugely entertaining as the guitar punctuates every line and the bass is worth listening for on its own. We journey back to Texas for the full-blooded shuffle of I Got This. The guitar and piano are again to the fore in this gentle romp. Album closer, The Bigger Picture, has a weird prelude of radio excerpts as harbingers of doom. The music then, surprisingly, takes on a sunshine island rumba feel as Kathy implores us to look for the things that matter. A warm Hammond solo keeps the musical mood as the lyrics reveal there is hope “in a world of sorrow”. So, here we have a varied album of blues-themed songs with exemplary musicianship and a vocalist of undoubted range, power and emotion. Special mention to Bill Jones who manages to infuse every track with an instinctive and clever style that makes them that much better. Don’t, however, expect anything earth-shatteringly different; just expect the blues played and sung very well indeed. Engineered by Jeff Botta at Single Pitch Studios in Austin, mixed and mastered Jack Miele, at Music Shed Studios in New Orleans.